SPECTRE, which had its world premiere October 26 in London, is the 2nd most expensive movie ever, with a budget of $300 million. Yet to be released in Canada and the USA, we are curious as how the royal game of chess is entwined in the plot. 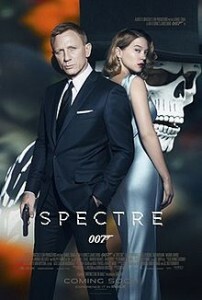 It appears that Mr. 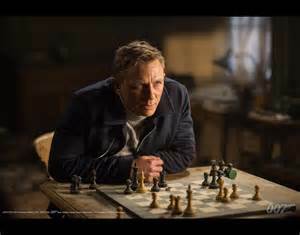 Bond has chosen the classic Staunton chess pieces. 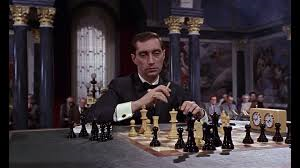 Of course the most famous depiction of chess in Bond films is a scene from 1963’s From Russia With Love. 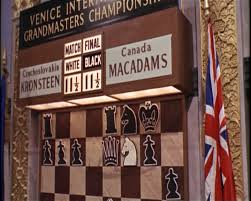 The Canadian Grandmaster McAdams is playing Grandmaster Kronsteen, a master plotter for the SPECTRE organization. 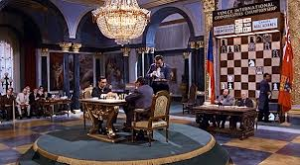 The game is modeled after the famous Spassky vs. Bronstein game at the USSR Championship in 1960.